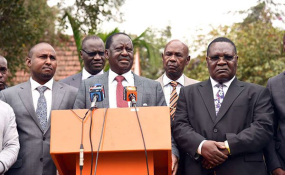 ODM party leader Raila Odinga addresses a press conference at Orange House in Nairobi on August 8, 2018, where he endorsed Ochillo Ayacko's candidature for the Migori senatorial seat. The burial of slain Sharon Otieno's unborn baby, which was to take place on Thursday, has been postponed due to financial constraints. Ms Otieno's family will inter the remains of the seven-month old baby a day later as the Homa Bay County Government has promised to chip in. Ms Melida Auma, Ms Otieno's, mother told the Daily Nation that the county requested the family to hold on as they make arrangements to help. Ms Auma said the baby's burial will be expensive so they need assistance from Homa Bay where her daughter was born and raised. "The county executive for water, Dickson Nyawinda, visited us yesterday and after consultations, we agreed to wait till tomorrow (Friday)," Ms Auma said at her home in Magare village, Homa Bay. Her husband, Mr Douglas Otieno, had on Wednesday pointed to financial constraints, saying: "Look at me. I cannot even attend court proceedings in Nairobi because I have no fare. It brings me more grief that I cannot be there to see the case unfold." When the Nation visited on Thursday, there was not much activity at the home. A few women prepared food while a group of men connected electricity from the main house to a structure that was constructed yesterday. Ms Auma said the infant's body will be transported from Kirindo Hospital Mortuary in Mbita on Friday morning for burial later in the day. "We will have buried my grandchild by noon," she said. The baby died after being stabbed by its mother's killers. Chief Government Pathologist Johansen Oduor, who conducted the autopsy on the Rongo University student's body, said she was stabbed in the left side of her stomach. "She had a stab wound in the abdomen from the back to the front. This killed the foetus," said Dr Oduor. Prior to her death, Ms Otieno had told her mother and other family members that Migori Governor Okoth Obado was responsible for the pregnancy. At a press conference in Nairobi on Wednesday evening, Mr Obado distanced himself from the brutal killing of the 26-year-old. His address came a day after he was grilled for eight hours by detectives of the Nyanza headquarters of the Directorate of Criminal Investigations. "As a law abiding citizen, I want to state very clearly and categorically that I have nothing, and absolutely nothing, to do with the cruel death of Sharon," he said at Serena Hotel. He has confessed to an affair with the student. The post mortem conducted at Rachuonyo Level Four Hospital in Oyugis, Homa Bay, showed that Ms Otieno died from excessive bleeding. The examination also showed that she was stabbed eight times - three times in the neck, four in the back and once in the left side of the stomach. The post mortem further found strangulation marks on the neck and several bruises on the body, indications that she tried to fight off the killers. "She had many bruises, an indication that she struggled in her death," said Dr Oduor. There was a high possibility that the student was raped by her killers as condoms were found that the scene of the crime. Ms Otieno's body and that of her baby were taken to Kirindo mortuary immediately after the post mortem due to safety issues raised by the family. Family lawyer Peter Kaluma, who is also Homa Bay Town MP, noted that Rachuonyo Hospital is close to the crime scene so the family was fearful. "We felt Kirindo was safer than Rachuonyo Level 4 mortuary. That is why we opted to move the body," the MP said. The family has asked the public to accord their daughter respect. "A lot has been said especially on social media. Those writing those false things may not have knowledge of facts. Stop rumour-mongering because this is a touchy issue which should not be meddled with falsehoods," said Ms Auma. The varsity student was abducted in Rongo town last Monday evening alongside Nation journalist Barrack Oduor, who escaped by jumping out of a moving vehicle.